As the biennium draws to a close, I’d like to express my sincere thank you to all members of District 6 for allowing me to serve as your Governor. It has been an honor and a privilege. I’d also like to thank the members of the D6 leadership team. They are an incredible bunch of individuals who served the district tirelessly for the last two years. We are luck that any of them are continuing to serve in the next biennium. With our Centennial Anniversary Celebration and the 2020 Convention in Chicago, District 6 has a lot to look forward to in the next biennium. Thank you to all who attended Fall Conference. By “Adding Your Voice”, you helped to make it a successful event. Please carry your enthusiasm and knowledge home to your Clubs. 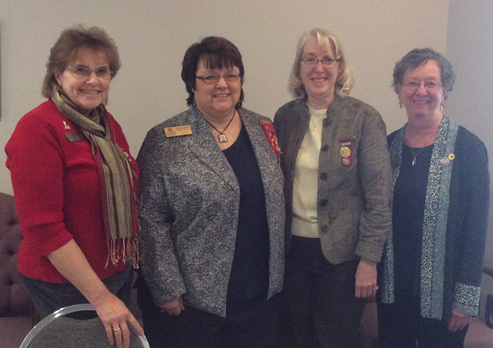 Remember the “Call to Action”; every Zonta member needs to be actively engaged for us to have healthy, vital clubs. To those who did not attend, my challenge was to encourage active engagement by every member. I defined “actively engaged” as being a passionate supporter of our mission and willing to give of your time, talent, and energy to support Zonta. Show Your Impact – “Meet” the women you serve. I look forward to seeing you at Spring Workshop and invite you to the 2017 Fall Conference October 13-15th in Madison Wisconsin. Note: It’s Badger Homecoming Weekend so book early!